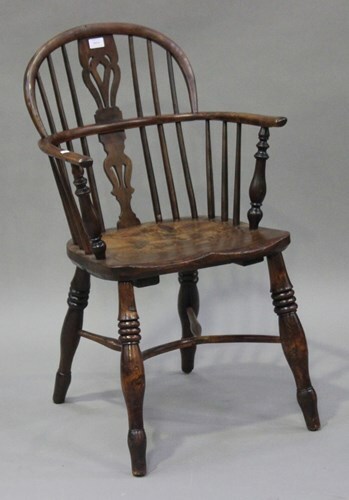 A mid-19th century yew, elm and ash Windsor armchair with a pierced splat back, the solid seat raised on turned legs united by an 'H' stretcher, height 90cm, width 52cm. 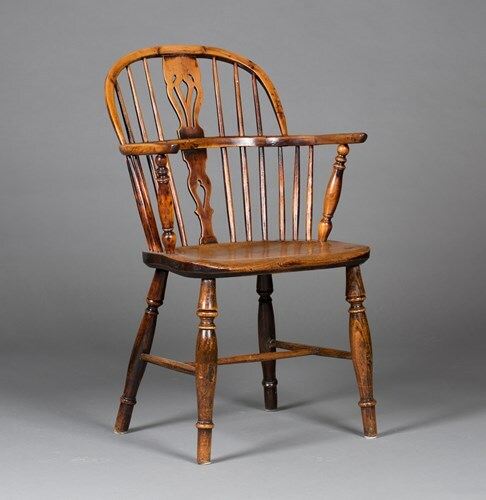 A mid-19th century yew, elm and ash Windsor armchair with a pierced splat back, the solid seat raised on turned legs united by a crinoline stretcher, height 90cm, width 54cm. 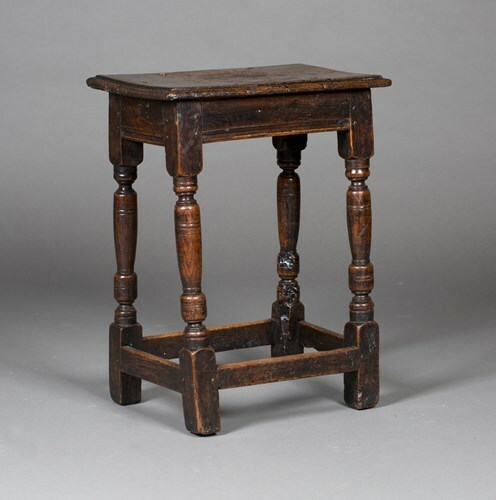 A 17th century provincial oak writing desk, the fall front revealing drawers, a well and pigeonholes above two short and two long drawers, on block feet, height 93cm, width 94cm, depth 55cm. 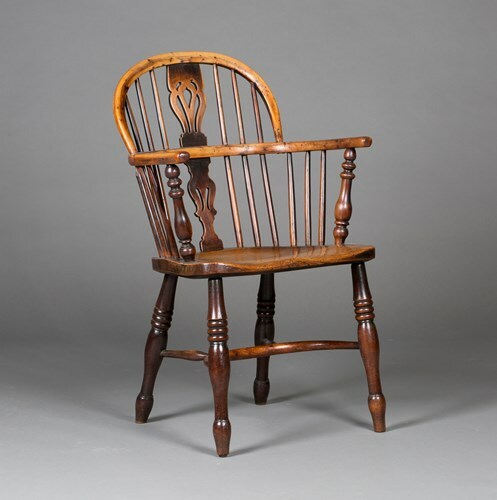 A 17th century oak joint stool, the moulded seat raised on turned and block legs united by stretchers, height 61cm, width 46cm, depth 31cm. 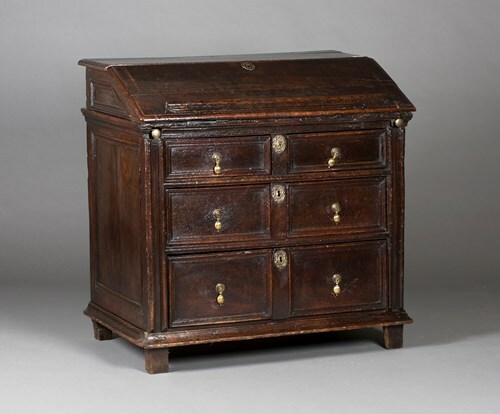 An 18th century provincial oak dresser, the shelf back with a shaped frieze fitted with wrought metal hooks, the base fitted with two drawers and a pot shelf, raised on stile supports, height 197cm, width 140cm, depth 41cm. 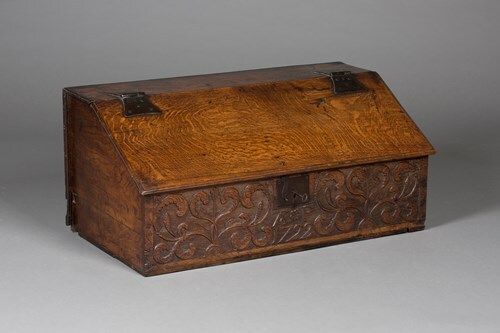 An 18th century oak table top chest, the sloping hinged top revealing drawers above a carved front panel, detailed 'A.F 1722', flanked by floral scrolls, height 38cm, width 86cm, depth 45cm. 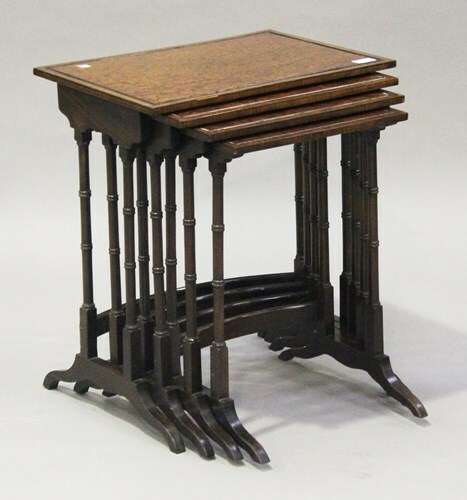 An early 20th century amboyna and mahogany quartetto nest of occasional tables, each top with a tulipwood crossbanded border, the turned and block legs on bracket feet, height 59cm, width 51cm, depth 35cm (some repairs). 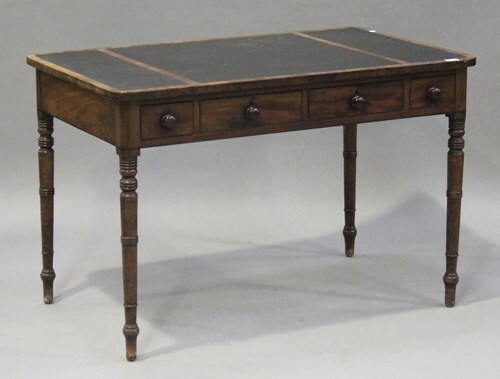 A late George III mahogany writing table with ebony banded borders, the top inset with three black leather panels above four frieze drawers, raised on turned legs, height 73cm, width 112cm, depth 69cm. 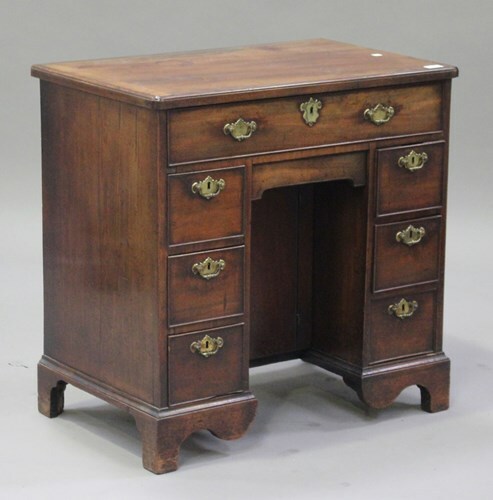 A George III mahogany kneehole desk, the moulded top above seven drawers and a cupboard, on bracket feet, height 76cm, width 76cm, depth 47cm (some faults). 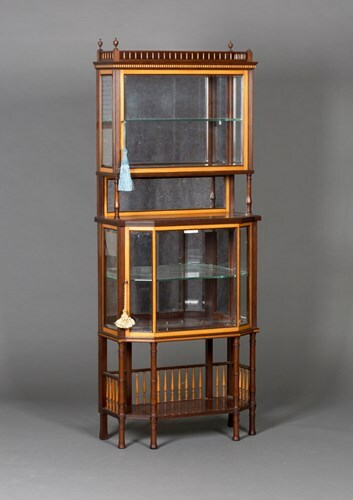 A late Victorian mahogany and satinwood crossbanded display cabinet of small proportions, in the manner of Holland & Sons, fitted with two glazed compartments enclosing mirrored interiors, raised on turned supports united by an undertier, height 162cm, width 63cm, depth 32cm. 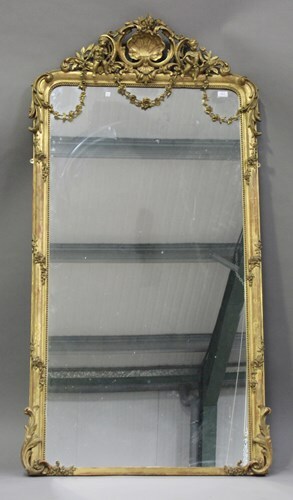 A late 19th century giltwood and gesso pier mirror, the shell surmount flanked by cherubs above floral swags, 180cm x 91cm. 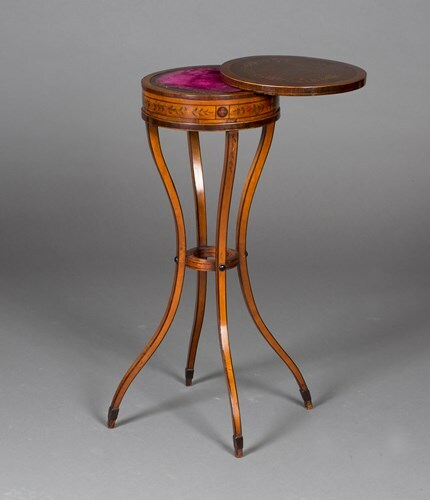 An unusual 19th century Sheraton style satinwood and floral painted lady's writing table, the circular rotating top revealing a hinged writing surface and a concealed compartment, raised on square tapering downswept legs, height 71cm, diameter 28cm. 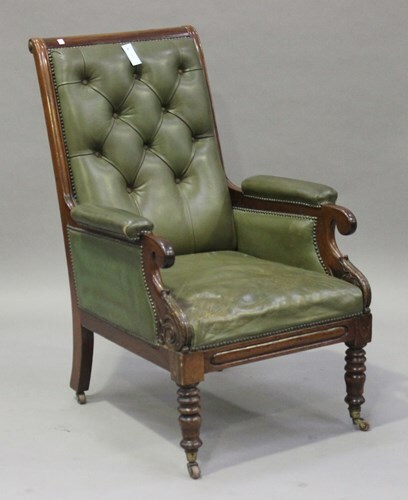 An early Victorian mahogany library armchair, upholstered in green buttoned leather, raised on turned legs and castors, height 109cm, width 72cm. 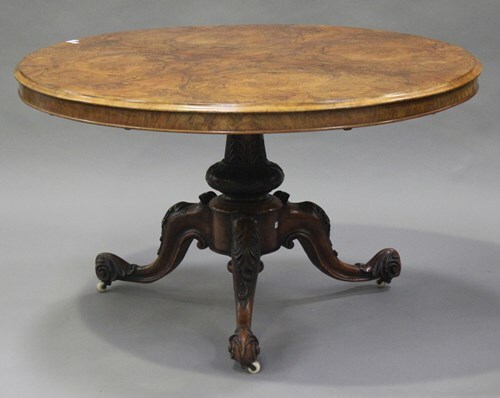 A mid-Victorian burr walnut circular tip-top breakfast table, raised on a carved baluster column and carved cabriole legs, height 75cm, diameter 123cm. 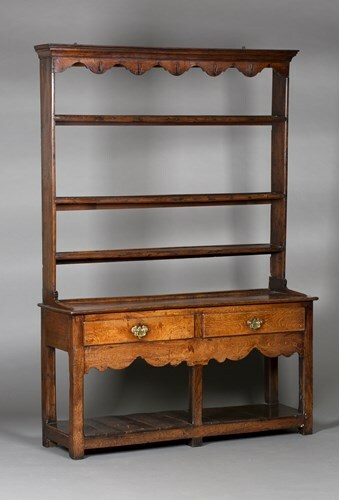 A Regency giltwood and gesso three-section overmantel mirror, the lattice moulded frieze above ribbed pilasters, 56cm x 149cm. 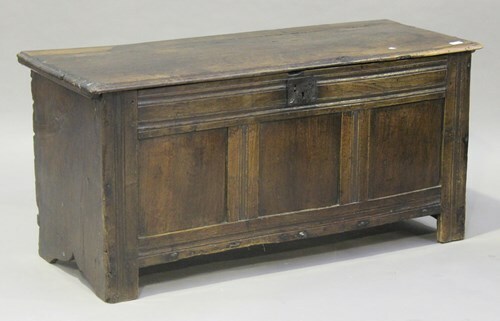 A 17th century oak panelled coffer, the hinged lid revealing a candlebox, the moulded front panels on shaped side supports, height 63cm, width 133cm, depth 49cm (alterations and restoration). 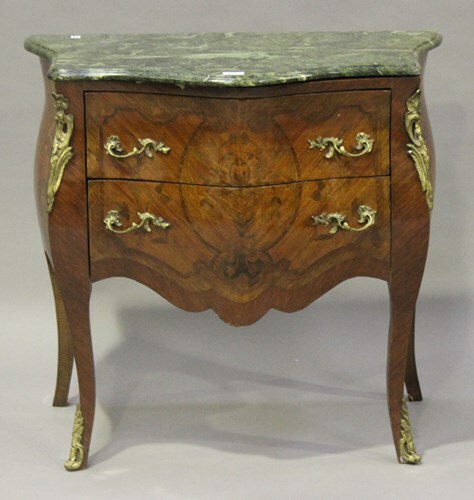 A late 20th century Rococo style kingwood and marquetry inlaid commode, the green marble top above two drawers, on cabriole legs, height 79cm, width 84cm, depth 46cm. 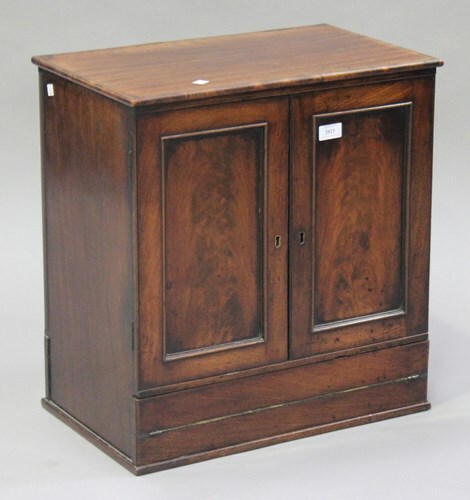 A Victorian mahogany writing cabinet, fitted with a pair of panel doors above a pull-out writing surface, height 55cm, width 52cm, depth 32cm. 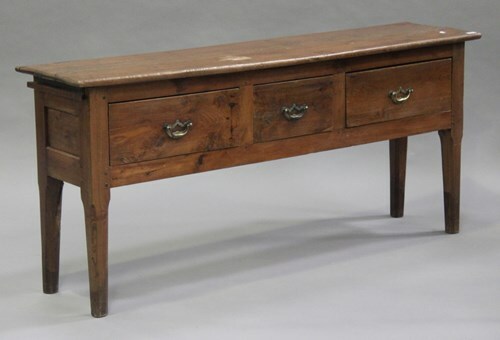 A late 19th/early 20th century French oak serving table, fitted with three drawers and an end slide, on tapering block legs, height 77cm, width 174cm, depth 41cm.